A FAILURE BY some gardaí to show understanding towards grieving families has been highlighted in complaints which were examined by a panel of legal experts. Yesterday, Minister for Justice Frances Fitzgerald published an overview report by the panel of the Independent Review Mechanism (IRM), which was established to consider allegations of garda misconduct or inadequacies. The team consists of two senior and five junior counsel. They carried out a review of 320 complaints, and while 249 of these required no further action, the panel noted a significant number would have been averted if there had been adequate communication from gardaí. A high proportion of complaints were made by people bereaved by the death of a loved one. 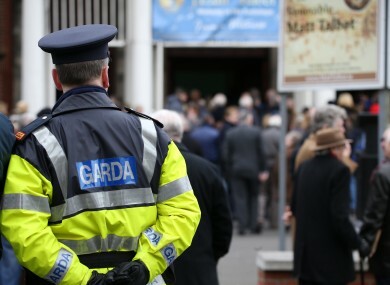 The panel said it is a “necessary condition of professional policing” that gardaí keep a certain level of emotional distance from the situations they encounter. However, this “defence against intrusive reaction to tragedy” has, according to the team of barristers, possibly resulted in a failure to show understanding of the “near-endless anguish” that close family members go through when questioning the last moments and movements of a person’s life. Gardaí were found to have dealt sensitively with family members in cases where a death occurred through an act of criminal violence like a homicide. It was in cases where there was no immediate threat to security or the community, that communication was lacking, with the shortcomings ranging from “the mildly perfunctory to the highly offensive”. Those for whom an equally random and avoidable death is in issue, resulting from human error, or in circumstances subject to different interpretations, often have added to their profound grief a form of involuntary self-torture, in which the final actions surrounding their loved one’s death are revisited constantly and made the subject of intense examination, speculation and hunger for clarity. Though it was noted that not all of these complaints had substance, failure in communication was most marked in these cases. In one example, the surviving family members of a person who had died under confused circumstances at a public venue found out details they had not previously known when they saw them in a local newspaper, because a senior garda briefed members of the media. Understandably, such insensitivity tends to foster resentment and suspicion of garda priorities. In a number of cases, people who had offered statements outlining alleged crimes against them, were left unaware of whether or not any form of investigation had been undertaken and, if so, whether prosecution was in prospect, for upwards of one year. The panel also noted that there was “wholly inadequate” communication to surviving family members of the deceased in a number of sensitive cases when inquests were convened. The report points out that among a small number of complaints, it was evident that genuine attempts were made by gardaí to provide information, but this resulted in this garda’s name being included in a complaint of what is perceived to be “a conspiracy”. This was often described as involving many State agencies and the panel said it was a “sad yet compelling observation” that some files reveal an obsessional mind-set in some of the complainants. In its recommendations, the panel said many of these complaints could have been avoided if policies that are already in place were uniformly observed. Since the drafting of this entry into the IRM review, the proposed heads of a bill have been published, which would give victims of crime greater rights to information. Email “Failure by gardaí to show understanding of 'near-endless anguish' of grieving families”. Feedback on “Failure by gardaí to show understanding of 'near-endless anguish' of grieving families”.